The Mech Turrets Addon is four different colored turrets with different features and are perfect to protect you and your buildings. Actually there are several similar addons for Minecraft PE, e.g the Wither Turrets attacking any enemy or the Utility Turrets mod which adds 9 cool turrets. But this addon is different, all the new turrets were painted in specific colors to easily use them. New turrets models. Now each has a unique design of different colors and with different barrels. How to get the turrets? The turrets do not have crafting recipes so the easiest way is the creative mode. If you play with a friend then send him this addon, and tell he should install it. Only when both players have installed the addon, you will be able to fully place the turrets and confront enemy armies. The turrets shoot different objects: snowballs and arrows, fireballs and shulker projectiles. Therefore, choose the turret depending on the damage. The new cannon looks great on castles and can destroy any aggressive creature. The turret has no effect on other players until it does not get damage. How to upgrade the turret? In the new version the creator has introduced a new system of improvements. Using some of the things you can upgrade your turret from the first to the third level. 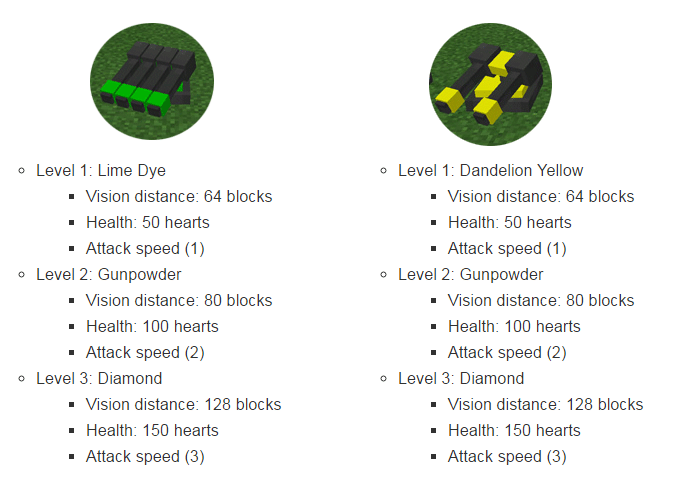 Upgrading relates to each type of the turrets and requires a certain item. See the list below and use the required items. There is restoring health turret. Just go to it and your health will increase, and this turret can store your things (like a chest). Currently there are 6 different turrets are designed for different purposes. Choose the right one for you and upgrade it to the maximum level. How to install the Mech Turrets Addon? 2. Activate the behavior and the resource pack.